Verbena Plants and species are found widely in both Europe and both North and South America. 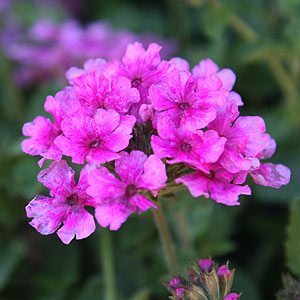 A spreading, sprawling or cascading plant, Verbena may not have the neatest growth habit. However the flowers are colourful and plentiful and this is the main attraction. Newer cultivars are coming onto the market with better and bigger flowers, a more compact growth habit and they are just as hardy as the old favourites. Although in the past these plants were known as Vervain, this is simply a genus in the Verbenacaea family, and the name is more commonly applied to the species that are used for herbal remedies. One of the other great characteristics is the low care nature, as long as the soil is well drained Verbena are happy. 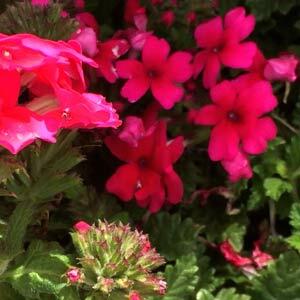 With so many varieties and cultivars for sale, plants range from 30 cm to 1m in height. The flowers are fragrant and range in colour from white through to pinks purples and reds. This depends a little on the species and cultivars. Nearly all Verbena do well in pots, especially when allowed to trail over the edge. It is and this trailing nature makes them suited to hanging baskets. Also excellent in the cottage garden where they seem to make themselves at home. V. rigida which is the purple Verbena are popular species. The V. Kazari and Superbena cultivars are the most commonly found in nurseries. Lemon Verbena is Aloysia citriodora. Verbena are drought tolerant plant that prefer a humus rich fertile, well-drained soil and full sun. Mulch can be used in winter to protect from frosts. These are a long flowering plant and are best planted at the end of the winter just as the weather warms up. This gives them a chance to settle in and flower freely from mid spring through summer. Fertilize in spring using any general purpose fertilizer.